This is our fourth episode covering the events at Verdun in early 1916 and it will be our last before the German guns begin firing on the French positions on February 21st. Up to this point in these episodes we have been discussing Falkenhayn, The Germans, and their plans for the attack almost exclusively. It is finally time to take a look at the French, what they had been up to, and how they prepared for the defense against the coming storm. The French story of Verdun centers around 3 people in the French military. This is our fourth episode covering the events at Verdun in early 1916 and it will be our last before the German guns begin firing on the French positions on February 21st. Up to this point in these episodes we have been discussing Falkenhayn, The Germans, and their plans for the attack almost exclusively. It is finally time to take a look at the French, what they had been up to, and how they prepared for the defense against the coming storm. The French story of Verdun centers around 3 people in the French military. The first was General Herr who was the commander of the Verdun area in the months before the attack. The second was Lieutenant Colonel Driant who commanded the French troops in the Bois de Caures north of Verdun and was also a former member of the Chamber of Deputies. The third and final person was General de Castlenau who would visit the region in early 1916 and put the French on the road to being prepared for the attack. After discussing the role that these three men played in the lead up to the battle we will discuss for a bit about what exactly the French knew of the attack, what they did not know, and why Joffre did not believe the severity of the situation even after the first attacks were launched. We will then close out this episode by taking a look at the German preparations and strategy for the air war over Verdun, which was larger than any air operation up to 1916. The concentration of planes was far greater and the strategies would evolve rapidly to try and utilize, and neutralize, these large numbers. Before diving into the story of General Herr we have to first talk about what the French had done to Verdun in the time between the start of the war and late 1915. The French command would get severe criticism both during and after the war for how they treated the fortresses around Verdun in the year and a half between August 1914 and February 1916. After the fall of Liege and Namur in the opening weeks of the war, both of which were theoretically fortress complexes just as capable as those at Verdun, the French command staff began to re-evaluate the role of fortresses in their planning. The Germans had been able to neutralize both Liege and Namur in a matter of hours and it was difficult to see how Verdun would be any different. Joffre, who was already predisposed to not like the large fortifications, was one of their most severe critics. The change in French thought began right from the beginning, right after the Battle of the Marne when Joffre ordered the French commander at Verdun, General Sarrail, to retreat behind the city and leave the fortifications to the Germans. Sarrail did not do this of course, or we would not be talking about Verdun right now, but it was an option that was very strongly considered. Even though the fortresses were still in French hands after the opening month of the war they were heavily de-prioritized and what this meant was that in early 1915 the French began to remove almost all of the movable armament from the fortifications all along the front. This included not just the guns in prepared positions behind the forts but also any movable guns from within the fortifications themselves. Through this the French were able to cobble together enough guns to create 43 heavy and 11 field artillery batteries for use elsewhere on the front. The only guns that generally stayed in the fortifications were those that were in the retracting gun turrets, but only because it would be so difficult to remove them. Along with losing guns most of the forts also lost their permanent garrisons who were replaced by skeleton crews of, usually, second line reservists. Both of these factors meant that the fortresses, even the largest like Douaumont were massively less effective at fulfilling their role on the battlefield. To slow the enemy and also provide a forward observation point for artillery in prepared positions to the rear. With the guns gone there were no guns to spot for, even if there were men capable of properly spotting. The role that these decisions would play in the larger course of the battle will be obvious. None of these changes seemed to be a big deal in late 1915 though, up to the beginning of 1916 Verdun was a quiet sector. It had been put under the command of the Governor of Verdun, General Herr, who had been given the task of improving the defenses around and behind Verdun. He was instructed to first improve the first line of defenses that incorporated many of the largest forts and then to create a second line closer to the city. Finally, he also had to create a third position behind the city that would be the last prepared position in the area. He was given specific orders that if the Germans attacked and there was any doubt as to whether or not the French troops could hold the line Herr was to order the retreat to abandon the city and the defenses on the northern and eastern sides in favor of the third line on the other side of the city. There was just one problem with this plan though, that third line that was supposed to be created never got past the "lines on a map" stage of construction. From the very beginning Herr was robbed of men and resources from both the forts and the infantry and this meant that most of the work was not completed before the attack. After Herr had taken over command in August 1915 he had urgently requested more men for the tasks given to him, by this point there were only about 3 divisions to man the lines around Verdun which was not enough troops to both man the trenches and create new ones. But this was right at the moment when the French were getting as many men as possible together for their fall offensives so able hands were hard to come by. There was also some difficulty in properly motivating the troops to follow through on the improvements assigned to them, even if the goals were manageable. Verdun was such a quiet sector that both officers and men were less inclined to really put in the work to improve defenses that they thought were unnecessary. The situation was so bad that when General Chretien arrived to take command of the Corps at Verdun in late 1915 he would say "In the Verdun zone of battle there was not a communication trench, not one underground telephone line, no barbed wire. But huge entanglements had been placed around the ramparts of the city itself…for the benefit of visitors." In February 1916 there would only be pieces of the second line created. On the critical right bank, where the German attack would fall in February the defenses were the weakest of any point in the line. Herr always fully understood the weakness of all of his positions, in late 1916 he would write "Every day I tremble; if I were attacked I could not hold; I've told the GQG and they refuse to listen to me." To add to this concern right at the last minute, in early February Joffre changed the Army Group that was in command of Verdun. Since Herr had arrived he had been under the command of the Eastern Army Group, but now he would be under the command of the Central Army Group. This seems, on the surface, to be a meaningless change of maybe some marks on some papers, but in fact it had a negative effect, as the commander of the Eastern Group General Dubail knew that it would. Dubail's concern was that it would disrupt the preparations underway to defend Verdun. While it was true that in the long run it would make more sense for the Central Army Group to have Verdun in the short term, which is all that would matter on February 21st, it provided another source of confusion and disorganization at a critical moment when the French knew that the Germans might attack soon. Verdun grew in importance in early 1916, up to this point the French high command, from Joffre on down had shown very little interest in the fortress city, but now they were giving it reinforcements to complete the defenses, and taking the steps to switch Army Groups to provide it better support. The reason for this all started with a letter, from a man named Emile Driant. In a vacuum Joffre probably would have never changed his mind about the importance of Verdun, it instead took events out of his control to increase the French Army's emphasis on the defenses. These events were driven by Lieutenant Colonel Emile Driant, who was stationed with his men of the 1st Battalion of Chasseurs to defend the Bois Des Caures wood to the north of Verdun. This was one of the elite regiments of the French Army and they had been at Verdun since the very beginning and had already played a role in many of the smaller clashes before 1916. Before the war Driant had been a politician and a member of the Chamber of Deputies and because of this he had many contacts in the French government back in Paris, one of those contacts was the President of the Chamber of Deputies Paul Deschanel. On August 22nd Driant wrote a letter to Deschanel describing his concerns about the current state of the defense at Verdun. Here is a small piece of the letter "The sledgehammer blow will be delivered on the line Verdun-Nancy. What moral effect would be created by the capture of one of these cities!...we are doing everything, day and night, to make our front inviolable…but there is one thing about which one can do nothing; the shortage of hands. And it is to this that I beg you to call the attention of the Minister of Defense. If our first line is carried by a massive attack, our second line is inadequate and we are not succeeding in establishing it; lack of workers and I add: lack of barbed wire" His primary concern, just like that of General Herr, was that he did not have enough men, there was a shortage of hands or of men. When this letter arrived in Paris it rapidly found its way to the desk of the Minister of War Gallieni and he reacted by sending an inspection team to verify the concerns of Driant at Verdun. The team then reported back and confirmed Driant's information. Gallieni quickly wrote a letter to Joffre asking him about the situation. The relationship between Gallieni and Joffre, which had not been very good before the war started, had only gotten worse since the Battle of the Marne. In his letter Gallieni wrote "Some differing sources have come to us giving accounts of the organization of the front and signaling some points of faultiness in the system of defense. In particular and notably in the regions of the Meurthe, Toul, and Verdun, the network of trenches is not completed as it is in the major parts of the front. This situation, if true, risks posing the most severe inconveniences." From all accounts Joffre was very angry when he received the letter, not so much due to its contents, but because it meant that somebody within the French army had went over his head and outside the chain of command to make reports directly to the politicians. Joffre responded back to Gallieni "can give the government assurance that, across the entire front, there are at least two main defensive lines, furnished with the necessary passive obstacles required to assure all the required resistance. In this region there exist three or four successive defensive positions, finished or on the road to completion. The organization is, on the whole, much better and more complete than that of our adversaries. . . . I consider that nothing justifies the fears you have expressed in the name of the government in your dispatch of 16 December." Some of the statements in this letter are laughable, 3 to 4 lines of defense? Better than our adversaries? While it is difficult to know if Joffre was lying in this letter or if he just did not know the current state of the defenses one thing is very clear, you could summarize the letter by saying "Shove off, there is nothing to see here." While Joffre was full of confidence when discussing the situation with Paris he did send de Castelanu to Verdun to inspect and report back on the situation in the region. This visit happened in early 1916, sometime in late January, and Castelnau was shocked with what he saw. Over the next 3 weeks he would Visit Verdun many times to try and rectify the situation. This prompted the change in overall command from the Eastern to Central Army group while Castelnau took a direct hand in trying to organize the defense by pulling in many more troops and labor manpower to try and finish some of the defenses. However, and critically, the first troops that were on their way to reinforce the divisions at Verdun were not scheduled to arrive until February the 12th, which just so happened to also be the original start date to the attack. This meant that if the attack had went off as scheduled there would have only been about 35,000 French troops to meet the 150,000 attackers but Castelnau was able to use the delay from the 12th to the 21st wisely. More troops were brought in, the second and third defensive lines were actually worked on, and although the work was slow due to the weather the efforts began to intensify as rumors of the oncoming attack became too loud to ignore. As we discussed last week, the Germans had tried their best to keep the attack at Verdun a secret for as long as possible. However, the French did learn about it as the day drew closer. After the war a French lieutenant who had been at Verdun in February 1916 would say that only the French high command was even remotely surprised about the German attack. At the end of 1915 Joffre strongly suspected that a German attack would fall somewhere, but that somewhere was very broad, it could have been against Russia, or Italy, or anywhere on the Western Front. This belief stemmed from the lack of the ability of the Allies to launch any large offensives during the winter of 1915/1916 which would give the Germans times to build up reserves and resources for an attack. Throughout the last 6 weeks of 1915 the French received information from a variety of sources that pointed to any number of possible areas for an attack. This misdirection was partially caused by the German attempt at obfuscation and part of it was just caused by faulty intelligence. One area that kept showing up in these reports was a German attack at Verdun, and these reports increased in intensity in January 1916. Joffre continued to refuse to believe that Verdun would be the location of the primary German attack because he did not see any reason for such an attack. In his mind it would not be possible to achieve a worthy objective with an attack in the area, and when you look at it through the lens of trying to achieve a breakthrough or capture territory in the traditional sense, he is right. But this was, of course, not what Falkenhayn had in mind. While trying to gather intelligence in the Verdun area the French were hampered by the weather just as much as the Germans. Planes were often kept on the ground for long periods of time, preventing any aerial reconnaissance which was a critical component of gathering front line intelligence by 1916. When the planes did manage to get up in the air they ran into serious problems of the German variety with masses of German fighter planes ready to meet them and keep them from flying over the German lines. When the pilots did manage to get some photographs the French intelligence units quickly saw that the Germans were not doing the one activity that they thought was essential to launching an attack, digging jumping off trenches. These trenches would be dug out into no man's land in the weeks before an attack to reduce the distance that the attacking infantry would have to be exposed in No Man's land. However the Germans were not digging them because they had a different plan, they would use their Stollen behind the line to protect the infantry before the attack and depend on the German artillery to destroy any front line defenses before the attack. If they dug jumping off trenches the French would know what was happening, just as the Germans had known in the fall about the attacks in Champagne due to the French digging. Essentially they were trading increased risk to their infantry during the initial attack for a greater element of surprise. However, there were other signs of the upcoming attack in January 1916 and one of the best sources of information was from German deserters. As the attack drew near there was a sharp increase in the number of deserters, especially from regions like Alsace that had recently been a part of France. And these deserters started to tell of the preparations then underway and later they told of all leave being cancelled in preparation for the attack. Eventually, even Joffre and the rest of GQG were forced to come around to the idea that the Germans were going to launch an attack at Verdun. An assessment of the situation was given to Joffre by his own intelligence staff on February the 11th “From a source normally very reliable, we learn that the Germans will try a large offensive in the region of Verdun. A large concentration of troops . . . should be established behind the [enemy] front. . . . The source also indicates a considerable concentration of heavy artillery. . . . The Crown Prince will direct the operation." However, even though the French high command now expected an attack at Verdun, they still did not expect it to be the primary point of effort for the Germans. Joffre instead expected it to be a diversion, launched to distract the French from a larger attack being prepared for another point in the line. He expected it to fall in Artois or Champagne. This did not prevent Joffre, after the strong prompting of Castelnau, to send in more troops into Verdun and this movement would gain a new urgency when a message to the German troops from the Crown Prince found its way into French hands. Reinforcements began to pour into Verdun during the second week of February and by the 21st a total of 7 divisions had been added to the defense, representing a more than 250% increase in the number of French troops. As the clock ticked down the French could feel that the action was about to start. Driant would write home "The hour is near…I feel very calm…In our wood the front trenches will be taken in the first minutes…My poor battalions, spared until now" and General Herr would send his last order to the troops not long before the German guns began to fire "Resist whatever the cost; let yourselfs be cut to pieces on the spot rather than fall back." Much like last episode when we ended the episode with a slightly off topic aside, we are going to do the same this week with a discussion of the upcoming air war over Verdun. Air power was becoming a more and more important aspect of the war in 1916, and you can expect a larger discussion of the changes in the air later this year. But I thought there was some interesting things happening in the air over Verdun throughout the battle that were worthy of a specific discussion before we get lost, just like the Germans and French themselves, in the mud of Verdun. Paul Jankowski in his book Verdun: The Longest Battle would say that "At Verdun airpower came of age, not as a remote contest between celestial warriors but as the spatial extension of terrestrial firepower" and in the early weeks of the fighting the Germans were the real drivers of the action. They had a plan right from the beginning and it was designed to accomplish two specific goals. The first was to, in the weeks leading up to the battle, keep the French aircraft out of the airspace over the German lines and to prevent them from learning about the attack. The second goal was to, once the attacks started, defend the German observation planes and balloons that were being used to direct artillery fire. To accomplish these goals there would be 168 planes, 14 balloons, and 4 Zeppelins involved in the fighting. This was far greater of a concentration than at any point by the Germans up to 1916, and it also provided the Germans with a staggering 5 to 1 advantage in the air. This advantage allowed the Germans almost complete air superiority during the early fighting. This was exactly their goal due to how important aerial observation was to properly utilizing the German artillery strength. The observation planes could not fly very high by modern day standards but even just a few hundred feet in the air gave the observers an unprecedented visibility of the battlefield. They could see not only their own guns, but the exact fall of the shells they were firing, allowing for fire to be accurately guided directly onto targets. To protect the observers there were 60 fighting planes that swarmed over the front, quickly intercepting any French aircraft brave enough to show themselves. The German air superiority also allowed them to utilize a large fleet of bombers over the front. There were around 80 heavy bombers available at Verdun and they were used to bombard various targets around the front, and even though they were slow and vulnerable they were still quite effective. The French just did not have the tactics and training necessary to deal with the large aerial bombardments at this point in history, some kind of anti-air doctrine just did not exist. Therefore the bombers were almost completely unmolested as they wandered around the battlefield dropping their bombs. They would also coordinate with the artillery fire so that there effects would not overlap too much. Even with the advantages that the Germans had they were not without their mistakes. These mistakes were often not apparent in the early fighting, just the sheer numbers of German planes made up for any tactical or strategic problems, but as the French brought in more and more planes they started to cause issues. The first problem was that the Germans were being too defensive with their fighting planes. They were attempting to seal off all of their lines, which was a huge undertaking and against a capable opponent would require many more fighters. When the French started to bring in more planes they would pick off some of the dispersed German planes by focusing on a specific point in the line to attack. The second problem that the Germans had was how they used their bombers. 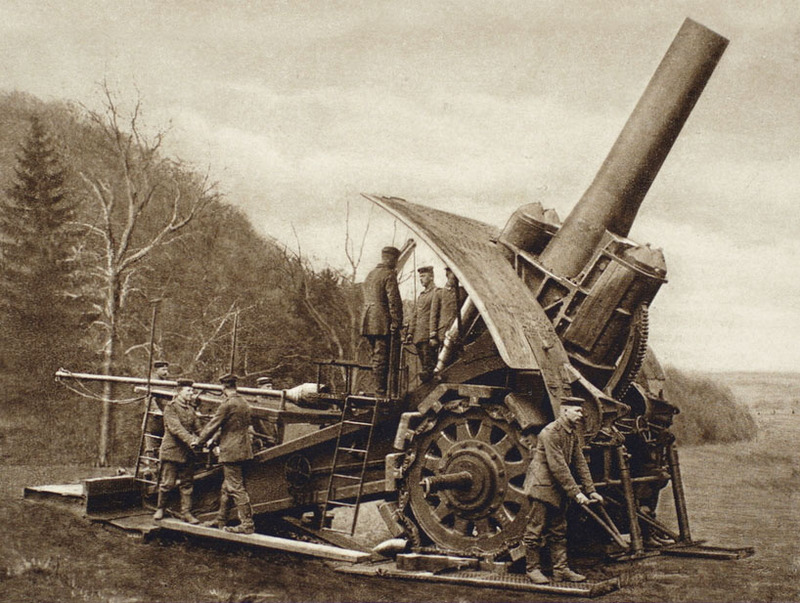 In hindsight the best way to have used the bombers would have been to execute precision strikes on the narrow supply corridors into Verdun which, while within the range of some of the German artillery, was beyond most of the German artillery observation and therefore difficult to hit. Instead the Germans mostly used their bombers on targets that could have also been targeted by artillery. Both of these mistakes, while not something that won or lost the battle, could have been rectified by the Germans to improve their chances. General Heoppner, who would later be the Chief of the Luftwaffe in World War 2 would say of these mistakes that "We did not exactly know what should be required of aviation." With a force as new as an air force these types of mistakes are understandable. The Germans did start to correct their mistakes though, in March Lieutenant Boelcke, one of Germany's most capable pilots arrived to take command of all German aircraft in the region and that is when the German air tactics began to evolve and react to the new French numbers. First the Germans began to be more aggressive by starting to reach out in numbers over the French lines, then the French started sending large numbers of fighting to protect just a few observation planes over the German lines utilizing the new found French numerical advantage, then the Germans reacted by setting up Jagdstaffel, or Huntin Packs, with several groups of 3 planes working together against the French formations. This system of advancement, of move and counter-move, over the battlefield would continue as both sides tried to determine a set of optimal air tactics over the front. Throughout all of these changes and all of the fighting one thing stayed consistent, they were fighting above the battlefield below where there was almost daily attacks. There are many instances of infantrymen at Verdun discussing the air battles that were happening overhead in their accounts of the fighting. On many clear days throughout the spring and summer it was not unnatural for both sides to be staring at the sky watching the spectacle happening above them as the German and French pilots fought for their lives. To the infantry stuck in the mud, even the deaths were glamorous for the pilots, so detached from the brutal deaths experienced on the ground. In May from his position on Mort Homme Raymond Jubert would say "[Pilots] gain equally the cheers of those who die beyond of any sort. They are the only ones who in the war have the life or death of which one dreams." The heights of the air battle at Verdun would come after the opening attacks in February though, and next week we finally reach the beginning of the attack as the German guns start firing on the 21st of February 1916.